It is a sad fact that so many lives are still being lost in architecture, construction and engineering (ACE) industries all over the world. While fatal accidents were fairly commonplace many years ago they are less so now, but the figures are still alarming. According to Safe Work Australia, between the year 2007 and 2012 there were 4.34 fatalities per 100 000 workers in the Australian construction industry*. Thinking back to the times when safety features were almost non-existent on any building site it is hard to understand why even more men were not killed. Workers would be literally exposed to the elements at great heights without a safety rope to catch them or protective equipment to wear. There are much more stringent health and safety rules and regulations in place now yet accidents do still happen in great numbers and industry strives continuously to reduce this worrying phenomenon. As well as better safety procedures and equipment there has to be top quality training for every new entrant to an ACE industry, along with continuing training as they progress. Educational information technology has a huge part to play in this training, in particular three-dimensional (3D) video modelling. Clearly you cannot put trainees into actual danger while following jobsite-based training but you need to get as close to it as you can. Like pilots learn to cope with emergencies in a flight simulator, ACE industry trainees can be put through something similar. 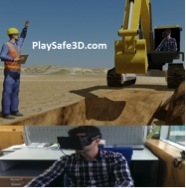 PlaySafe 3D by Focus Design is bringing interactive, immersive safety training to the office desk. 3D video modelling lends much to the video games industry and this is an area of technology that should be familiar to most young entrants into the ACE industry too. It is possible to create a realistic virtual environment, in eye-catching 3D where trainees can focus on the essential safety techniques that they will need to keep them alive when they step out into the real world of a construction site. It is being proven that this kind of training is having a significant impact on safety figures. A typical example would be a training application that heightens electrical hazard awareness in the constructions industries across the USA, using 3D online computer games. There is no doubt that 3D video modelling really does work when it comes to training ACE industry employees. As an example of such an industry leader in the field, Focus Design – 3D construction animation specialists, are developing the latest interactive safety learning technology with a product called PlaySafe 3D. The directors are engineers and have a first-hand passion for the importance of safety on engineering and construction projects. If you’re interested PlaySafe 3D and safety simulations, it’s certainly worth visiting Focus Design at www.focusdesign3d.com.